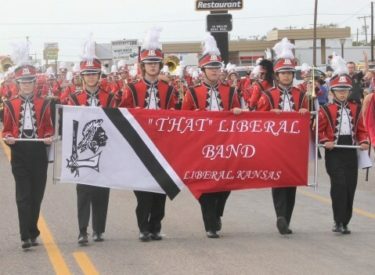 “That” Liberal Band Boosters is an organization dedicated to supporting “That” Liberal Band and Color Guard programs. The Boosters is comprised of parents, family, friends and neighbors of the high schools band and color guard students. In order to have a successful band and color guard program, we need an active and supportive band and guard parent organization. Each of you as parents, family, and friends have special talents to contribute to your student’s musical success! Please attend our monthly booster meetings, every 2nd Monday of the month at 6 p.m. in the band hall to find out ways how you can volunteer your time and talent to the Booster organization. This month we will meet at 6 p.m. on Monday, October 9, 2017. EVERYONE is welcome to join! Your support directly supports your local band! Your support will help improve our music programs today and plan for healthy music programs for the future!